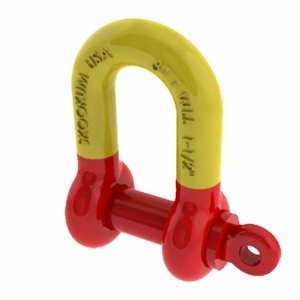 Unlike some of their logging shackles, Skookum has made their #270 shackle with a more common frame. Unlike anchor shackles, it has straight sides. While there's not a specific advantage to this style of shackle, we do have customers that prefer it. Because it's made of alloy steel, the strength-to-size ratio is incredible and far exceeds that of a typical shackle. This makes it a popular choice for general construction, marine and municipal applications. This shackle allows a spud wrench (or marlin spike for loggers) to be passed through the eye and used as leverage for either tightening or loosening the pin.